Ground transport items include sections of tram lines, ground transport stops, and bus stations. 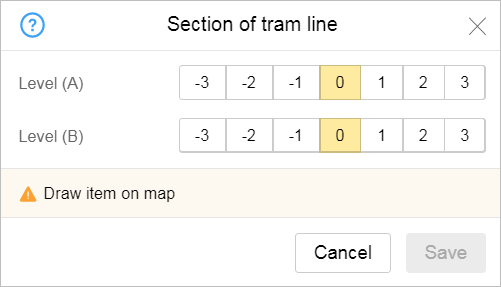 Use Level A and Level B attributes so that intersections of tram lines with other transport lines display properly when they are located on different levels (such as if one is on ground level and the other runs through a tunnel). Enter values for the road level in the Level A and Level B fields — for the beginning (A) and ending (B) points of a line section. “ground level” — if the lines intersect at ground level. “on a bridge”, “on a bridge (+1)”, “on a bridge (+2)” — above ground level. For example, if one line that goes through an intersection passes over another on a bridge or as part of an interchange and the second road or railway is at ground level. “In tunnel”, “in tunnel (-1)”, “in tunnel (-2)” — below ground level. For example, if one line at an intersection passes through a tunnel and the second line goes through a tunnel at a different level. Names of public transport stops are set according to the rules given in the section 1.3.1. Object name: General rules and n 3.1.4.2.2 . 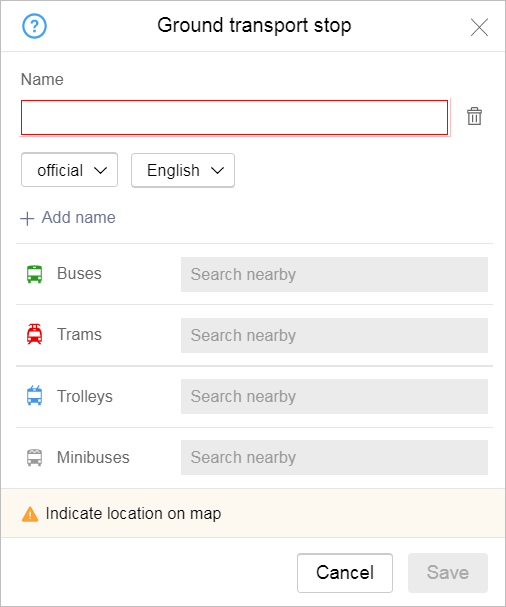 For public transport stops, use the name types Official, For caption on map and Also known as, historical (don't use other types of names). Public transport stops should use their full names with no abbreviations as official names (some common abbreviations are fine). Make sure to use uppercase in transport stop names. Do not use quotation marks in transport stop names. Sometimes, a route passes through a locality with two stops: one inside that locality and the other on the main road as it's making a turn for said locality. If both stops share the name of the locality, they should be labeled as follows: the first stop should retain its namesake, while the second stop should say “Turn for...” before the locality's name. Use Kamenka for the stop inside the village. Use Turn for Kamenka if the stop is a turn for the village. Use Kamenka if the distance between the turn and the locality is less than 1 km. Use Turn for Kamenka if the distance is more than 1 km. Note. You can replace the word Turn with other terms more suitable for the area. For instance, Bend or Exit. If a locality has several stops named after it with different numberings (such as Kashino-1 and Kashino-2), use the hyphen between the name and the number, no spaces. However, if the name itself already contains a number (e.g. Tyosovo-2), then the format should be as follows: “Tyosovo-2 — 2”. to unnamed stops On demand. If you need to clarify a stop name (such as adding the corresponding locality to its name as well as any other elaboration except numbers), use dashes and spaces for your clarification. Example: Smolevichi — Zarechnoye stop, Moskovskaya St. — End of line. Note: you can only use the “End of line” marker for a last stop when it shares the name with the stop before that. In this case, the penultimate stop would be Moskovskaya St.. If a stop has no official name, you can use the name of the nearest street, a place where passengers congregate (such as a store), or any other notable landmark as a substitute. If the official name of a stop and the name used on route signage differ, then give priority to the more commonly used name. Furthermore, all remaining station names can be added in the “also known as, historical” field. If several signs with different names are posted at a stop, then write these names in the official name field separated by a slash (/). If the stop has been officially renamed, but the sign has not been updated, then enter the new name for the official name. You can only use the phrase “On demand” as the proper name of the stop. In this case, you do not need to fill in the other name types. If a stop has a proper name, then do not add the “On demand” phrase to it. You do not need to add explanatory annotations to stop names (to indicate that the stop is the last one on the route or that passengers can only get on/off there). Note: you can only use the “End of line” marker for a last stop when it shares the name with the stop before that. In this case, the route would be Moskovskaya St. → Moskovskaya St. — End of line. The name for the map caption is specified if it differs from the official name, such as if there are words that should be abbreviated according to the general naming rules (see Section 3.1.3.1. Types of names: General rules ). Caption names should match the name used on route signage as closely as possible. You can use certain abbreviations in the name if they are used on route signage. For example: Dispatching station → DC. Such names are not edited by users. For “Also known as, historical” names, you should include the official transport stop code if it is used in passenger services (such as SMS services that send information about the next route). In this case, the transport stop code will usually appear on the route signage for that stop. 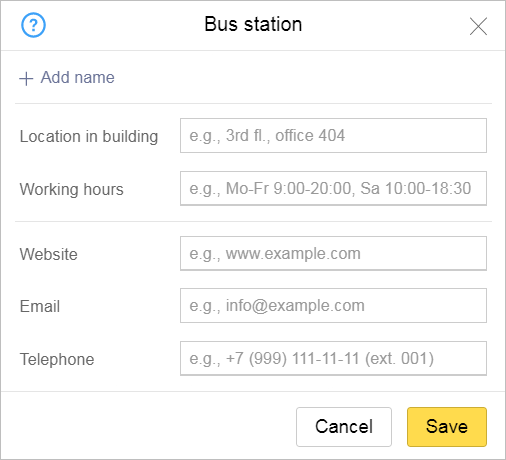 You can also enter different variations on the proper name if they are listed in the official name field separated by slashes (“/”). 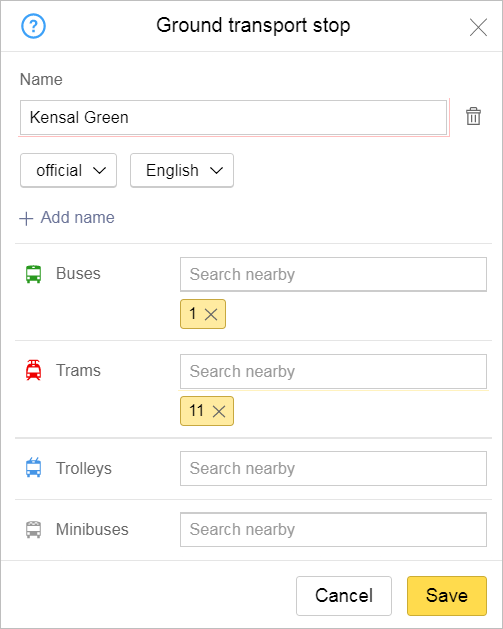 In the “Routes” fields, enter the route number for each type of transport that uses that stop. If the route number you need is not in the list, enter it in the line (this creates a new route). For map item names, write building names that are part of route numbers exactly as they are written on route signs. The values that are entered appear in the orange stripe. To delete a route number from a given transport stop that it no longer services, click the cross in the appropriate stripe. 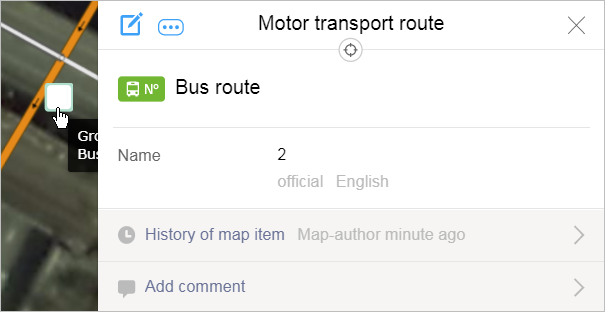 To edit route parameters, click on the stripe containing the route number. For more information, see 3.14.2.4. Rules for creating public transport routes and adding attributes to them. Is set in accordance with the General rules, see 3.1.3.1. Types of names: General rules . It is assigned in accordance with the rules that are given in Section 3.1.4. Forbidden items . Items of this type display on the map along with their type (therefore you should not enter a name in the “For caption on map” field). Furthermore, the official item name will appear on the map (for example, Soligorsk Bus Station). Location in building: The information should not duplicate the address of the building in which the organization is located (see Section 3.5.2. Rules for attributing addresses ). Rather, it should provide supplementary detail: indicate the placement of the organization in the building. Enter the days of the week and times when the business or organization is open. For example: “Weekdays 9:00-20:00, Sat 10:00-18:00”. You can enter website addresses with or without the “http://” part. In the “Site” field, you should not enter the item author's address or any other addresses that do not relate to the item itself. In the “Site” field, you can enter several addresses separated by commas. You must enter the bus station's email address in the “Email address” field. You can not enter the map-item author's email address or other addresses that don't relate to the item itself. “CCC-CC-CC” – phone number (the number of digits may not always be seven). Examples of correct number formats: +7 (495) 222-22-22, +7 (34111) 2-22-22. You must enter the organization's phone number in the “Telephone” field. You can not enter the author of the map item's number or any other numbers that don't relate to the item itself in the “Telephone” field. Rules for creating public transport routes are described above (see point 3.14.2.2.2 Routes. To edit route parameters, click on the stripe containing the route number in the attribute panel for that ground transport stop. The map should have scheduled routes for all kinds of urban, suburban, and intercity land transportation, such as buses, trams, trolleybuses, and marshrutkas. Urban, suburban and intercity routes come first. After most of them are complete, you can then draw the interregional and interstate routes they comprise. Other existing ground transport routes that carry passengers on a regular basis. Temporary routes (those that run for less than two weeks). Chartered urban and suburban routes that are not accessible to the public (such as corporate shuttles, service vehicles, or chartered tourist minibuses). Even if the same route is serviced by different transport providers and/or types of vehicles with varying passenger capacities, you should only create one “Route” item on the map. You should only create different independent routes if the various carriers follow different itineraries or the routes have different names. After you enter the route attributes, you should link them to the transport stops where the vehicle stops (going in order in both directions). Be sure to include stations where passengers only embark or only disembark). Do not include stations where the vehicle passes by but does not stop. Click Edit in the route's attribute panel. Stops that are already included in the route will be marked . When naming public transport routes, only use the “Official” and “Also known as, historical” name types. Don't use other types of names. Don't enter old route numbers or names of carriers in the route attributes. Official route name — its number. You can only identify the route using formats like “First stop — Last stop” or “First locality — Last locality” if a route doesn't have an official number. Which of these options you choose will depend on what is customary in that area and how stops are indicated on route signage. What times or days a route operates (for example, do not write weekdays, weekends, on Fridays, during summers). You can identify the itinerary using the format “First stop — Last stop” or “First locality — Last locality” along with the number for the “Also known as, historical” field. You can also enter important intermediary points on the route if it would not be clear what the exact route was otherwise. For example, for bus #501 connecting Moscow and Lyubertsy, you can enter Moscow (Vykhino Metro) — Lyubertsy (Turist Subdistrict) for "also known as."